The images below provide examples of symptoms observed with parvovirus B19 infection. 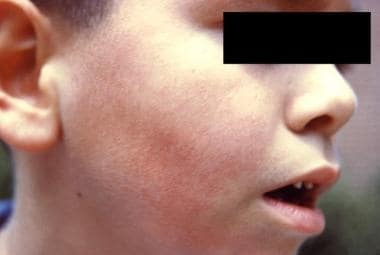 Note the right side of this boy's face displaying signs of erythema infectiosum, or Fifth disease. Image courtesy of CDC. Elementary school child with Fifth Disease. Image courtesy of CDC. 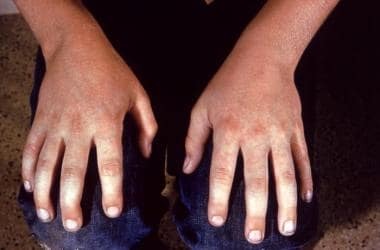 Erythema infectiosum (Fifth disease) is described in clinical manifestations below. In patients with hemoglobinopathies or hemolytic anemias, in whom the duration of erythrocyte survival is decreased, a decrease in the reticulocyte count to less than 1% (usually to 0%) may precipitate TAC. Such a crisis is characterized by profound anemia caused by a temporary halt in new erythrocyte production. Abnormal erythrocytes, such as those associated with hemoglobinopathies, have a significantly shortened half-life because they are removed from circulation by the reticuloendothelial system. Any interruption in new erythrocyte production may trigger a crisis. The bone marrow during TAC reveals an absence of erythroid precursors and the presence of striking giant pronormoblasts; rarely, necrosis may occur. Parvovirus B19 is the only infectious cause of TAC known and has been shown to be the cause of aplastic crisis in over 80% of patients with sickle cell disease. [2, 8] . Patients who are immunocompromised (eg, receiving chemotherapy or immunosuppressive drugs or have immune defects [congenital and acquired]) may develop chronic parvovirus B19 infection that results in chronic anemia. Pure red cell aplasia (PRAC) persists until the virus is cleared and should be distinguished from the transient anemia described above. [8, 5, 6, 10] Chronic parvovirus B19 infection in transplant recipients has been linked to anemia, other hematologic abnormalities, myocarditis, and pneumonitis. Pediatric patients with hematologic malignancies and parvovirus B19 infection have suffered prolonged anemia that interferes with chemotherapy timing  . Hydrops fetalis, perhaps the most serious complication of parvovirus B19 infection, may occur when a nonimmune woman is infected, usually in the first 20 weeks of pregnancy. The most critical gestational age appears to be 13-16 weeks' gestation, when the fetus has the highest rates of hepatic hematopoiesis. Infection in the pregnant patient is further covered below. In general, parvovirus B19 infection affects males and females in equal numbers. Adult females are more likely to develop postinfectious arthritis. Cossart YE, Field AM, Cant B et al. Parvovirus-like particles in human sera. Lancet. 1975. 1:72. Pattison JR,Jones SE, Hodgson J et al. Parvovirus infections and hypoplastic crisis in sickle cell anaemia. Lancet. 1981. 1:664. Serjeant GR, Topley JM, Mason K, Serjeant BE, Pattison JR, Jones SE, et al. Outbreak of aplastic crises in sickle cell anaemia associated with parvovirus-like agent. Lancet. 1981 Sep 19. 2(8247):595-7. Cherry JD, Schulte DJ. Human Parvovirus B19. Feigin RD, Cherry JD, Demmler-Harrison GJ, Kaplan SL, eds. Feigin & Cherry's Textbook of Pediatric Infectious Diseases. 6th ed. Philadelphia, PA: Saunders Elsevier; 2009. Vol 2: 1902-1920. Servey JT, Reamy BV, Hodge J. Clinical presentations of parvovirus B19 infection. Am Fam Physician. 2007 Feb 1. 75(3):373-6. [Medline]. Anderson LJ, Hurwitz ES. Human parvovirus B19 and pregnancy. Clin Perinatol. 1988. 15:273. Brown KE. Parvovirus B19. Bennet JE, Dolin R, Blaser M. Mandell, Douglas and Bennett's Principals and Practice of Infectious Diseases. 8th ed. Philadelphia, PA: Churchill Livingstone Elsevier; 2015. Vol 2: 1840-1847. American Academy of Pediatrics Committee on Infectious Diseases. Parvovirus B19. Kimberlin DW, Brady M, Jackson SA, Long SS, eds. 2015 Red Book: Report of the Committee on Infectious Diseases. 30th ed. Elk Grove Village, IL: American Academy of Peiatrics; 2015. 593-596. Landry ML. Parvovirus B19. Microbiol Spectr. 2016 Jun. 4 (3):1-13. [Medline]. Schneider, E. Human Parvoviruses. Long SS, Pickering LK, Prober CG, eds. Principles and Practice of Pediatric Infectious Diseases. 4th ed. Philadelphia, PA: Churchill Livingstone Elsevier; 2012. 1087-1091. Burns K, Parish CR. Parvoviridae. Knipe DM, Howley PM, eds. Fields Virology. 5th ed. Philadelphia, PA: Lippincott Williams & Wilkins; 2007. Vol 2: 65. Mustafa MM, McClain KL. Diverse hematologic effects of parvovirus B19 infection. Pediatr Clin North Am. 1996 Jun. 43(3):809-21. [Medline]. Ergaz Z, Ornoy A. Parvovirus B19 in pregnancy. Reprod Toxicol. 2006 May. 21(4):421-35. [Medline]. Luzzi GA, Kurtz JB. Human parvovirus arthropathy and rheumatoid factor(Letter). Lancet. 1985. 1:1218. Conrad ME, Studdard H et al. Case report: aplastic crisis in sickle cell disorders: bone marrow necrosis and human parvovirus infection. Am J Med Sci. 1988. 295:212. Eid AJ, Brown RA, Patel R, Razonable RR. Parvovirus B19 infection after transplantation: a review of 98 cases. Clin Infect Dis. 2006 Jul 1. 43(1):40-8. [Medline]. Lindblom A, Heyman M, Gustafsson I, Norbeck O, Kaldensjo T, Vernby A. Parvovirus B19 infection in children with acute lymphoblastic leukemia is associated with cytopenia resulting in prolonged interruptions of chemotherapy. Clin Infect Dis. 2008 Feb 15. 46(4):528-36. [Medline]. Young NS. Hematologic and hematopoietic consequences of B19 parvovirus infection. Semin Hematol. 1988. 25:159. Mendelson E, Aboudy Y, Smetana Z, Tepperberg M, Grossman Z. Laboratory assessment and diagnosis of congenital viral infections:Rubella, cytomegalovirus (CMV), varicella-zoster virus (VZV),herpes simplex virus (HSV), parvovirus B19 andhuman immunodeficiency virus (HIV). Reprod Toxicol. 2006. 21:350-382. Adler SP, Koch WC. Human Parvovirus Infections. Remington JS, Klein JO, Wilson CB, Baker CJ. Infectious Diseases of the Fetus and Newborn Infant. 6th ed. Philadelphia, PA: Saunders Elsevier; 2006. 868-892. Tolfvenstam T, Broliden K. Parvovirus B19 infection. Semin Fetal Neonatal Med. 2009 Aug. 14(4):218-21. [Medline]. Simms RA, Liebling RE, Patel RR, et al. Management and outcome of pregnancies with parvovirus B19 infection over seven years in a tertiary fetal medicine unit. Fetal Diagn Ther. 2009. 25(4):373-8. [Medline]. Infections. Cunningham FG, Leveno KL, Bloom SL, Hauth JC, Gilstrap III LC, Wenstrom KD, eds. Williams Obstetrics. 22nd Ed. USA: McGraw-Hill; 2001. chap 58. Crane J, Mundle W, Boucoiran I, Gagnon R, Bujold E, Basso M, et al. Parvovirus B19 infection in pregnancy. J Obstet Gynaecol Can. 2014 Dec. 36(12):1107-16. [Medline]. Ornoy A, Ergaz Z. Parvovirus B19 infection during pregnancy and risks to the fetus. Birth Defects Res. 2017 Mar 15. 109 (5):311-323. [Medline]. Broliden K, Tolfvenstam T, Norbeck O. Clinical aspects of parvovirus B19 infection. Jrnl Internal Med. 2006. 260:285-304. Hirai Y, Takeda Y. Atypical rashes in adult human Parvovirus B19 infection; atypical is typical. IDCases. 2016 Jun 23. 5:32-3. [Medline]. Grilli R, Izquierdo MJ, Farina MC, et al. Papular-purpuric "gloves and socks" syndrome: polymerase chain reaction demonstration of parvovirus B19 DNA in cutaneous lesions and sera. J Am Acad Dermatol. 1999 Nov. 41(5 Pt 1):793-6. [Medline]. Fretzayas A, Douros K, Moustaki M, Nicolaidou P. Papular-purpuric gloves and socks syndrome in children and adolescents. Pediatr Infect Dis J. 2009 Mar. 28(3):250-2. [Medline]. Tschope C, Bock CT, Kasner M, Noutsias M, Westermann D, Schwimmbeck PL. High prevalence of cardiac parvovirus B19 infection in patients with isolated left ventricular diastolic dysfunction. Circulation. 2005 Feb 22. 111(7):879-86. [Medline]. Douvoyiannis M, Litman N, Goldman DL. Neurologic manifestations associated with parvovirus B19 infection. Clin Infect Dis. 2009 Jun 15. 48(12):1713-23. [Medline]. Kleinman SH, Glynn SA, Lee TH, et al. A linked donor-recipient study to evaluate parvovirus B19 transmission by blood component transfusion. Blood. 2009 Oct 22. 114(17):3677-83. [Medline]. [Full Text]. Bredl S, Plentz A, Wenzel JJ, Pfister H, Möst J, Modrow S. False-negative serology in patients with acute parvovirus B19 infection. J Clin Virol. 2011 Jun. 51(2):115-20. [Medline]. Soderlund-Venermo M, Hokynar K, Nieminen J et al. Undefined. Persistence of human parvovirus B 19 in human tissues. 2002. 50;:307-316. Musiani M, Zerbini M et al.Gentilomi G et al. Parvovirus B19 clearance from peripheral blood after acute infection. J Infect Dis. 1995. 172:1360-1363. Anderson MJ, Higgins PG, Davis LR, Willman JS, Jones SE, Kidd IM. Experimental parvoviral infection in humans. J Infect Dis. 1985 Aug. 152(2):257-65. [Medline]. Failey CK, Smoleniec JS et al. Observational study of effect of intrauterine transfusions on outcome of fetal hydrops after parvovirus B 19 infection. Lancet. 1995. 346:1335-1337. [Guideline] Center for Disease control and Prevention. Risk associated with human parvovirus infection. MMWR. 1989. 38:81. Ferrari B, Díaz MS, López M, Larralde M. Unusual skin manifestations associated with parvovirus B19 primary infection in children. Pediatr Dermatol. 2018 Nov. 35 (6):e341-e344. [Medline]. Bascietto F, Liberati M, Murgano D, Buca D, Iacovelli A, Flacco ME, et al. Outcome of fetuses with congenital parvovirus B19 infection: systematic review and meta-analysis. Ultrasound Obstet Gynecol. 2018 Nov. 52 (5):569-576. [Medline]. The authors and editors of Medscape Reference gratefully acknowledge the contributions of previous coauthor Dennis Cunningham, MD, to the original writing and development of this article.